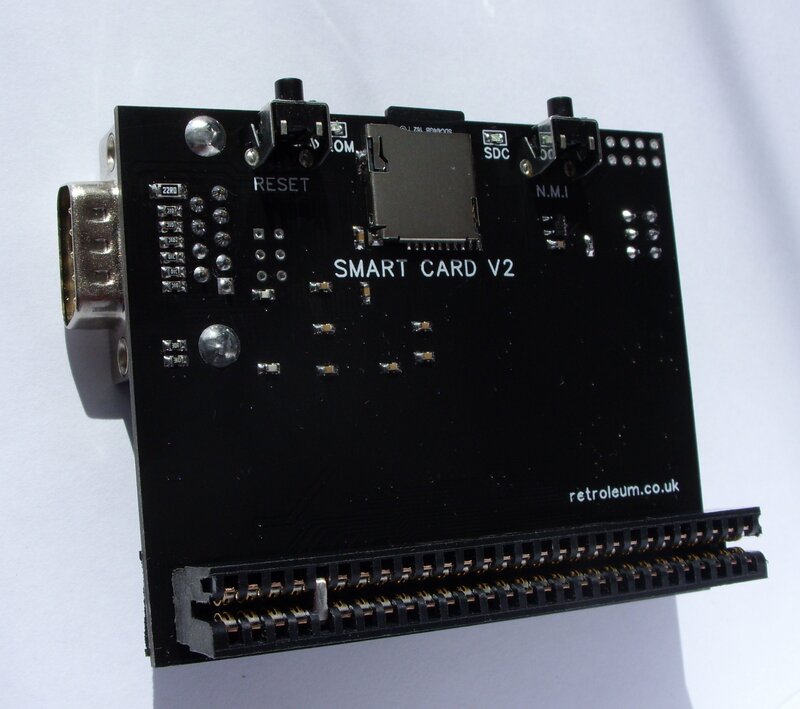 The SMART Card is an expansion board for the Sinclair ZX Spectrum. I designed it mainly as a low-cost, simple to use game loader and as such it features a Kempston compatible joystick interface, SD card slot and reset / NMI buttons. You just need to insert a microSD Card containing you favourite games (.sna and .tap files are supported), power up and select a title from the menu that appears. (Game files take about 3 seconds to load from SD card). For the more technical user, it is also a multi-ROM switcher – the onboard flashRAM can hold fifteen 16K ROMs and these can be selected from a menu, with the default ROM being freely selectable. 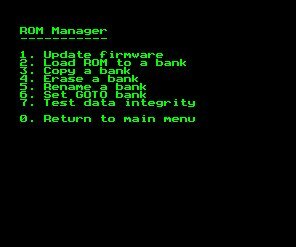 The supplied firmware includes a ROM manager program to load, copy and erase the ROM images in the flashRAM. (The interface also has 128 KB of SRAM onboard). 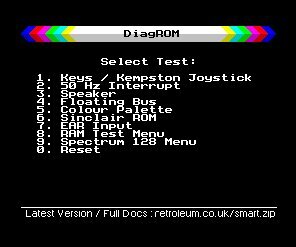 My own Spectrum diagnostic ROM is pre-installed in one of the ROM slots – this means the card can be used to test faulty Spectrums (identify bad RAM chips etc). Of course, any other Spectrum diagnostic ROM can be installed too. The NMI button acts as a game freezer and allows Pokes to be entered and snapshots (.sna files) to be saved. The interface is aimed at 48K Spectrum users but the V2 SMART Card will fit the 128 Spectrum models too (though at present only 16/48K games are supported). Full details including manual, firmware files etc can be downloaded via the link at the top of this page. If you’re interested in buying a SMART card they are available from my retro spares store. I should add my standard disclaimer that I am a mere hobbyist and this is just one of my projects that I’ve decided to make available to the retro community (EG: I hand-solder the PCBs, there may be software bugs and so on. Of course, each board is tested before dispatch). Q. Which models of Spectrum is the SMART Card compatible with? A. The SMART Card V2 will fit all versions of Spectrum – it currently supports 16/48K games only . The firmware and game loader are not compatible with 16K Spectrums. You can use the DiagROM mode to test all Spectrum models. Q. What type of game files will it run? A. It runs 48K Snapshot (.sna) files and most .tap files too. 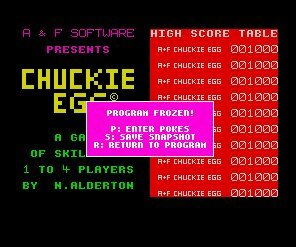 If you can’t find a .sna version of a game you could always load the .tap or .tzx version into a PC-based Spectrum emulator and save it as a .sna file from there. Q. Can I get a case for it? A. I don’t supply cases myself but there are designs for a 3D-printed case on the net, made by users. Here’s one by Johan Engdahl. Q. How long does a game take to load. A. A .sna file takes about 3 seconds to load from the SD Card. (.taps generally take a little longer, maybe 5 seconds). Q. What’s the difference between .sna and .tap / .tzx files? A. .sna files are ‘snapshots’ of the Spectrum’s memory taken whilst a program/game was running (usually at the title screen) and when re-loaded, the program will continue running from that point. .Tap files are more like a digital archive of the entire cassette tape recording, which means multi-load games can be accommodated. (.tzx files are more complicated and support the encoding of non-standard loaders – they’re only useful for PC-based Spectrum emulation). Q. How do I update the firmware and ROMs on the SMART Card? A. Put the ROM files on your SD Card and hold the Zero key on power up to go to the manual ROM Selector Menu, then press Enter to go to the ROM Manager and follows the prompts. Full details are in the user manual. Q. Can you supply a SD card full of games? A. Although most Spectrum games are freely available at World Of Spectrum etc, I’d prefer not to risk offending anyone by appearing to cash in on their work. Therefore I think it’s best if you download your favourites yourself. Q. What does the SMART Card acronym stand for? Q. Can the SMART Card LOAD and SAVE files to SD Card from Sinclair BASIC? A. Not really – the SMART Card was not designed with this level of OS integration in mind (there are other interfaces on the market that will do this). You can save programs from BASIC as a .sna file using the NMI button, however. Q. Will there be updates etc? A. Sure, I update the project with improvements from time to time, usually without much fanfare. See link at the top of this page for the latest files. Q. Is the SMART Card a clone of DivMMC? Can it run esxDOS etc? A. No – and as far as I know – no. The PCB, logic and software are my own unique designs. The SMART Card is a low-cost, user-friendly game loader which has some useful extra features such as the diagnostic ROM. I made it from scratch as a hobby project so it was not designed to accommodate any existing interface specifications (apart from the Kempston joystick port of course). Q. How is the onboard memory organized? Q. Can the SMART Card be used in conjunction with any other interface (IE: those with through-ports)? A. I would not recommend it – it has not been designed with this in mind. Q. Is the project open source? A. Not at present. Details about its pins, port registers etc are in the documentation. I will obviously help users with any technical questions. A. It should do, yes. The SMART Card does not use the troublesome signals “M1 “and “Clock” from the Spectrum’s motherboard. Q. Can the SMART Card SAVE snapshots. A. Yep, the latest version of the SNAPLOAD ROM has this feature. Q. Can I enter POKEs into games.